Somewhat unexpectedly, the topic of irony is becoming a subsidiary thread in the Hannibal Blog. It started here, continued here and, I’m sure, will continue even more. You recall that my definition of irony is “the savoring of contradictions in life and people (others and yourself) and of turns of phrase that are slightly and adroitly off-key and thus meaningfully surprising.” This wording found approval, at a minimum, by Cheri. Irony in its original Socratic sense, in Greek eironeia, is really pretty different. In brief, it’s the habit of concealing one’s superiority. Aristotle, in the Ethics, lists irony as a vice, though he says it’s a vice characteristic of those who are refined. Why refined? Because if irony is a vice opposed to the virtue of truthfulness, it is a kind of deceit. It is also much better or more attractive than the vice of boasting, of claiming to be more than you are. The ironic person claims to be less than he is, and in particular to be less wise. Aristotle, by the way, gives only one example of the ironic person: Socrates. Socrates is famous, then, for his irony, for his kind of graceful concealment of his wisdom; he’s not a boaster, in this sense. This means that Plato chose as his spokesman, or at least as the central character in almost all the dialogues, an ironist, somebody who’s not altogether frank. Do these Greek masters of irony, their “superiority” hidden by their deceit (cleverness) claim to be less capable, insightful, than they really are? Do they, deep inside, feel superior? Let me quickly correct the spelling of Charles Saunders Peirce’s name. I just Googled Peirce and am reading, Cheri. Complicated stuff. Lots about semiotics, but none of it obvious. But I’m grateful for the tip. He seems to be one of the great American scientists/chemists/logicians/philosophers, and I had, frankly, not even heard of him. 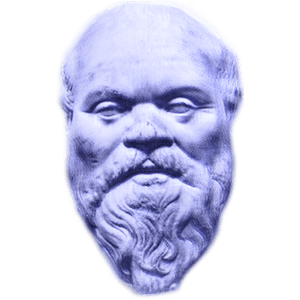 Regarding Socrates: I’ve pondered this man and this aspect of him a lot. I myself have always wondered whether he was in fact “fishing” when he claimed to know nothing. If so, he succeeded, because the oracle told him he was the only wise man. His strategy and style was to walk up to anybody, powerful or not, who thought he knew anything at all, and then, through shrewd questioning, make evident to all present that the person in fact knew nothing at all. The official version today is that he did this in the honest search of truth. But the Athenians then came to see him as an annoying and subversive wise guy, as I myself probably would if he had exposed my ignorance in front of everybody. So they trumped up some nonsense about him corrupting the youth and defaming the gods, then condemned him. In short, there definitely was some reverse-arrogance in him. And some deceitfulness. And I’m not for that. But he was also brilliant and curious and witty, and I’m for that. A great play, by the way, is Aristophanes’ The Clouds, in which Aristophanes mocks Socrates ruthlessly. Quite easy to read. All of Athens, including Socrates, was present when it was first performed. I will get The Clouds and read it. By the way, the Peirce essay on Fixation of Beliefs is the one I was thinking about. There he examines doubt and belief. True Beliefs are the ones that we live, not espouse. I am not sure how to italicize on WordPress. The code to italicize is simple, Cheri. But I can’t write it here, not even in quotes, because it would … italicize rather than be displayed. But you can find the code here. Let’s see if this works..heels down, back straight, elbows low, chin up and over the jump. And by the way, the Parthian Shot was news to me.